At the district's Welcome Back Rally on August 13, Superintendent Cheryl Jordan talked about building a "championship team," which she referenced during the Board of Education meeting Tuesday evening. "I'm very excited to introduce to the Board and to the community new members of that team," she said. In Closed Session, the Board approved Superintendent Jordan's recommendation of two certificated managers. During Jordan's report in Open Session, she introduced and recognized the new Assistant Superintendent of Human Relations and Interim Assistant Principal of Thomas Russell Middle School, both effective August 22, 2018. Trustees also approved the appointment of three certificated managers and a classified manager made by Jordan during the summer. After they were each recognized, one at a time, they came forward to say a few words. Prior to joining Milpitas, Brunson served as the Assistant Superintendent of Human Resources in the Yuba City Unified School District starting in 2017, Director of Human Resources in the Davis Joint Unified School District from 2014 to 2017, and Principal of Douglass Middle School in Woodland Joint Unified School District from 2005 to 2014. In addition, Brunson has 20 years of experience in negotiations. During the Board Meeting on Tuesday, Brunson shared his positive experiences in Milpitas so far. "Day one, I came into this room to do a tier one interview and was made to feel very welcome," Brunson said. "I asked the panel what they feel most proud of in Milpitas, and they said family. It feels like a family here. And that's what endured me to wanting to be here even more." He added: "I believe in service leadership: take care of our adults so we can take care of our students, who are our number one priority." Watch the acceptance video here. 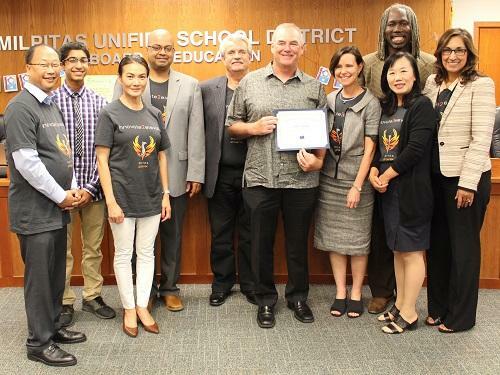 Dutra has been with Milpitas Unified for 26 years, where he has served as a seventh and eighth grade history teacher at Thomas Russell Middle School. At Russell, he has held a variety of roles that have allowed him to gain experience as a leader of staff and students including Principal of the middle school summer program, chairing the Social Studies department, managing the athletic department, teaching the leadership class, and coaching various sports, to name a few. During his speech, Dutra spoke about a previous student who recently visited him before starting school at Yale, where he will attend with a full ride. "Later that day, I thought about Kevin and how the 'Culture of We' is so important in the lives of the students we work with," Dutra said. 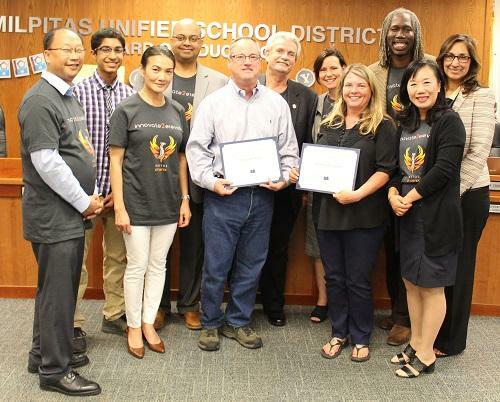 "Whether it was those teachers Kevin had at his elementary school who passed Kevin on to Russell or the teachers at MHS who helped guide him along the way, we all played an important role in the development of the students of Milpitas." He added: "And although my position will change at Russell, the goal remains the same: to help all of our students become successful individuals who will make a difference in our community and our world. With that, I am ready to take on this challenge and continue to make Russell and Milpitas Unified a great place for students." Hanna Asrat, Burnett Principal, effective August 1: Twelve years ago she began her career in education and for eight years she taught second and third graders at two elementary schools in Santa Clara Unified School District. During that time, she began serving as a mentor teacher and this coaching led her to work for three years at Partners in School Innovation, which focuses on supporting teachers, instructional coaches, and principals to implement research-based practices that transform schools. Last year Asrat was the Assistant Principal at Burnett Elementary School, where she worked with then Principal Richard Julian to build systems and enact plans to enhance the school's strengths and address their needs. She shared her excitement in continuing to serve the Burnett community. Watch the acceptance video here. Kristina Ravo, Spangler Assistant Principal, effective July 31: Ravo comes to Milpitas from San Jose Unified, where she was an Assistant Principal of Instruction at Burnett Middle School since 2016. Before then, she served as Activities Director at Branham High School for a year following seven years teaching at Santa Clara High School. Although she has spent eight years working towards helping students get to college or careers, she shared her eagerness to now work with the development of children before they get to high school. To prepare for a transition to the elementary level, Ravo participated in Early Literacy walks at Trace Elementary in addition to shadowing two elementary principals in her current district. In addition, Burnett and Spangler Elementary have similar demographics, which Ravo mentioned having an interest to serve. Jordan said that as she was walking through schools on the first day, someone shared with her that they think Principal Luis Lopez and Ravo make a "dynamic administrative team." Watch the acceptance video here. Damian Huertas, Coordinator II of Special Education/Student Services, effective July 30: Huertas has more than nine years of experience providing comprehensive administrative and operational support to staff, families, and students with educational needs. He previously worked at the Santa Clara County Office of Education as an Assistant Director of Special Education and, prior to that, as an Middle School Special Education Supervisor at San Francisco Unified School District and SPecial Education Coordinator II at Palo Alto Unified School District. He wants to focus on family engagement and said his place in the schools, which is why he wanted to come back to a unified school district so he could provide services directly in the classroom. Watch the acceptance video here. Kristine Dinneen, Supervisor of Behavior Intervention Therapists, effective August 3: Dinneen has more than eight years of Applied Behavior Analysis (ABA) experience, coming to the District from East Side Union High School District where she was a Behavior Intervention Specialist. Before that, she worked at the Center for Speech Language and Occupational Therapy and Pacific Autism Center for Education. Dinneen has also offered experience in collaboration and training as an experienced manager who has enjoyed the opportunity to collaborate with and support fellow staff and IEP team members. Superintendent Jordan and the Board of Education honored Coach Kelly King, who was named the 2018 California Football Coach of the Year. 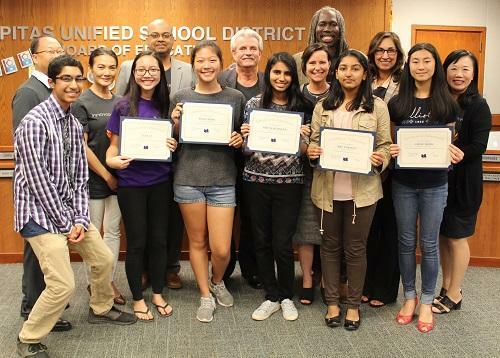 Superintendent Jordan and Trustees recognized Advisors David Carter (Milpitas Xtreme Robotics), Elena Sherbakov (Milpitas High STEMgirls), Mentor Vicky Tu (MHS '12, Yale '16, Software Engineer at Google), and students Sinai Chang, Tran Le, Nikita Bilaskar and Chloe Wang (from the finalist team) in addition to Amy Stanley, who participated in a two-day VEX Robotics Girl Powered Workshop August 11 and 12 at Google for high school and middle school girls (students currently in 5th grade going to 6th grade are eligible). The workshop was a collaboration between the Robotics Education & Competition (REC) Foundation and Google. In the VEX Robotics Competition ( https://www.vexrobotics.com/vexedr/competition ) teams of students are tasked with designing and building a robot to play against other teams in a game-based engineering challenge. Some of the girls became finalists in the competition. Superintendent Jordan and Board Members presented Certificates of Appreciation to Andrea Hutchison, Brian McGarry, and Tricia Brownstein for being Academy Leads with the 21 kids who participated in the Oath Internship over the summer. 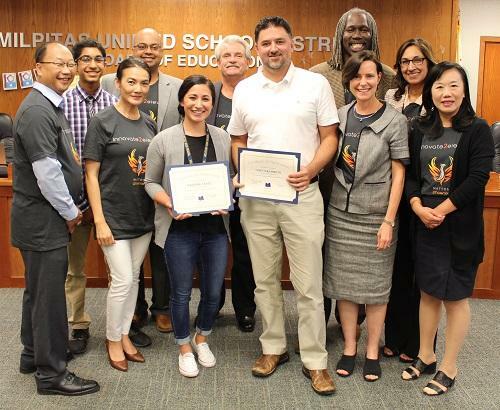 Superintendent Jordan and the Board of Education presented certificates of appreciation to counselor Cory Nakamoto and college and career technician Marissa Canez from Milpitas High School, who made Senior Awards Night a success in May. Counselors Beth Harke and Jennifer Evarkiou were not present at the meeting, but will also receive certificates for their work with the event. Summer School administrators reported on the multiple summer extended learning opportunities for students. New programs this year included additional math support, Love4Literacy Kinder Camp and enrichment opportunities through the partnership with San Jose Community College. Other programs included Extended School Year (ESY) , SEAL, Summer Bridge, ELD, Middle School and High School academic classes, as well as the early reading intervention class for incoming third graders. A highlight of the summer program this year was the Love 4 Literacy Kinder Camp, held at Randall Elementary School . The camp made a significant impact for its families, with Principal Deanna Sainten sharing pre- and post-data which included the following question, "I feel my child is ready to start kindergarten." Before the program, 35 percent were very satisfied, 29 percent were satisfied, 29 percent were neutral, and 7 percent were dissatisfied. Following, 75 percent said they were very satisfied, 8 percent were satisfied, and 17 percent were neutral. 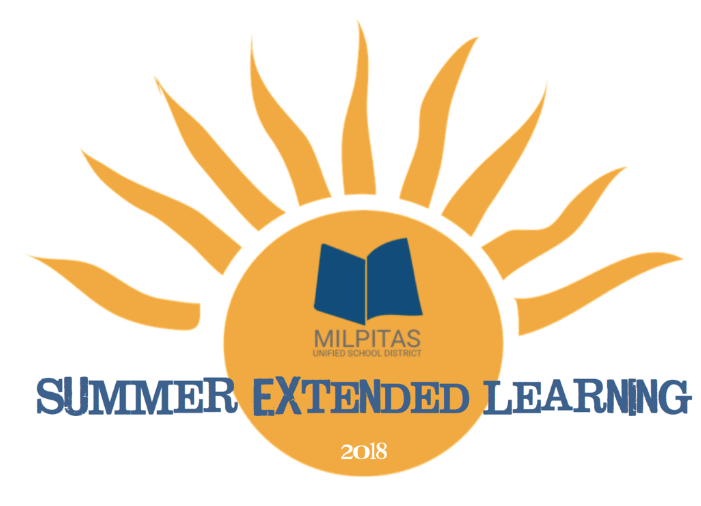 Through all the programs, the District reached 1,200 students with six new or extended programs, six administrators, and three school sites (Rose and Randall elementary school and Rancho Middle School) in addition to offsite at the San Jose Community College Extension. The 2017-18 school year marked the fourth year of California’s revamped statewide student assessment system - California Assessment of Student Performance and Progress (CAASPP). Raquel Kusunoki, Director of Elementary Education, gave a presentation about t he CAASPP system, which consists of Smarter Balanced assessments administered in grades 3 through 8 and 11 for English language arts/literacy (ELA) and mathematics. The assessments are aligned to the California content standards for ELA and mathematics, reflect the critical thinking and problem solving skills that students will need to be ready for college and the 21st century job market. The Summative Assessments results were the focal point of this analysis. These assessment results serve to evaluate students’ progress and performance in grade level academic standards. This report provided an overview of the 2017-18 results. Of the highlights, Kusunoki said the District has outperformed the county and state in both English language arts and mathematics the last four years. As she looked at this year's results, she said there was a lot to celebrate but it is still important to pay attention to the gaps by ethnicity. 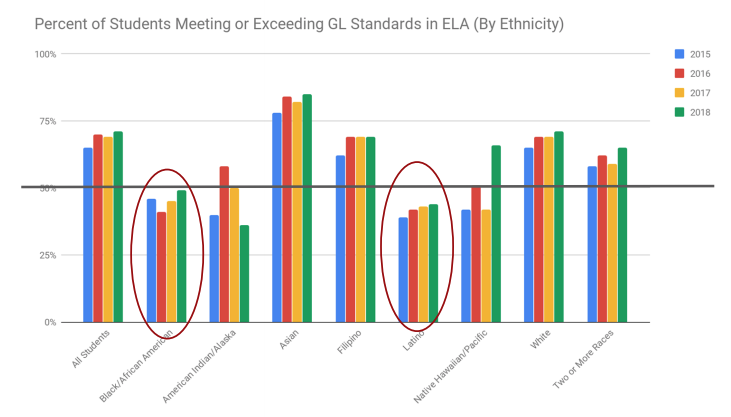 For example, African American and Latino groups haven't hit the 50th percentile in terms of meeting or exceeding grade level standards in English language arts over the last four years in addition to Native Hawaiian/Pacific Islander and American Indian in mathematics. To look at making a positive change, Kusunoki said all schools will be engaging staff in the analysis of their school data, identifying strengths and needs and planning next steps by the end of September. Additionally, the school data will be shared with stakeholders the end of September and there will be a data summit during the October 3 Management Meeting.